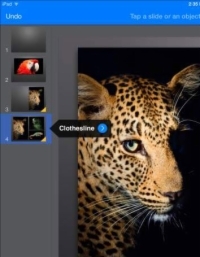 You can enliven a Keynote presentation on your iPad and make it a better communication tool by using Keynote animations to animate the transition as you move from one slide to another. Tap a slide and then tap Transition from the toolbar that appears. Tap OK to begin setting a transition. 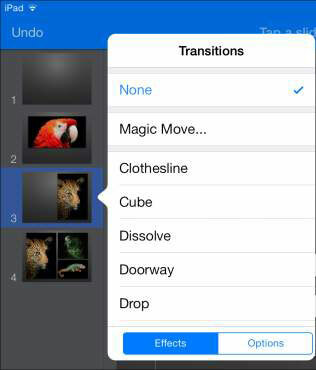 When you tap OK, you move to the transition editor. 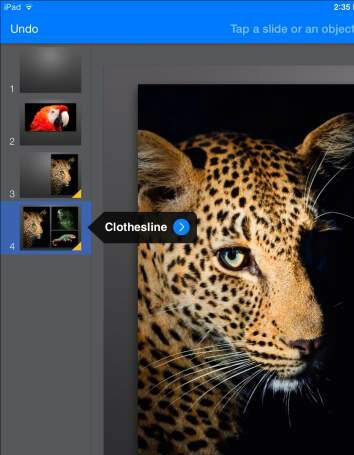 Notice the Done button in the top-right corner of the screen — until you tap the Done button, you’re working on a transition. Though a transition may appear to happen between two slides, it happens after you tap a slide to go to the next one. The transition is attached to the first slide in the sequence of two adjacent slides. 1In the navigator on the left side of the screen, tap the slide for which you want to build a transition and tap Transition on the toolbar that appears. 2When you find a transition effect that interests you, tap the name and then tap Play to select it and see a preview. 3Tap the Options button in the bottom-right corner of the popover to set the effect options, as shown in this figure. 4Set the duration and when the effect starts. 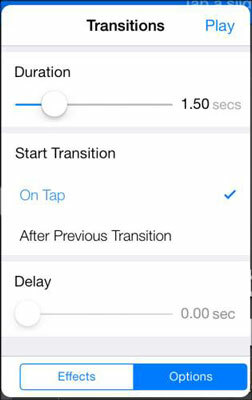 If you want the effect to start after a delay of a certain duration, use the Delay setting. 5Continue to change the effects and options until you’re satisfied. You’ll probably want to try the combinations by tapping the Play button in the upper-right side of the popover several times. 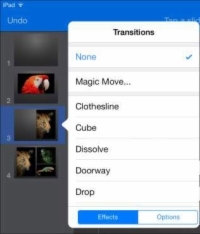 After you apply a transition effect to a slide, it appears whenever you select that slide in the navigator and then tap Tools___Transitions and Builds, as shown in the figure.